Hopefully with the ability to recruit some for the establishment of a Community Heritage Centre. He has also promoted the request for more members of a management Committee, of which MLHS will be represented. The Community Asset transfer Lease for the former Angus Council Access Office is being given serious consideration. We should in the next month or so be notified whether or not we have been successful. We have held a Public meeting to alert the community of their obligation regarding the management and financing of a proposed Monifieth Community Heritage Centre, should the lease be granted to our group. As you are aware this would create the need for the formation of a Heritage Centre Management Committee with representation from MLHS, whose volunteers members have managed the House of Memories , for fourteen years , as a Community project. 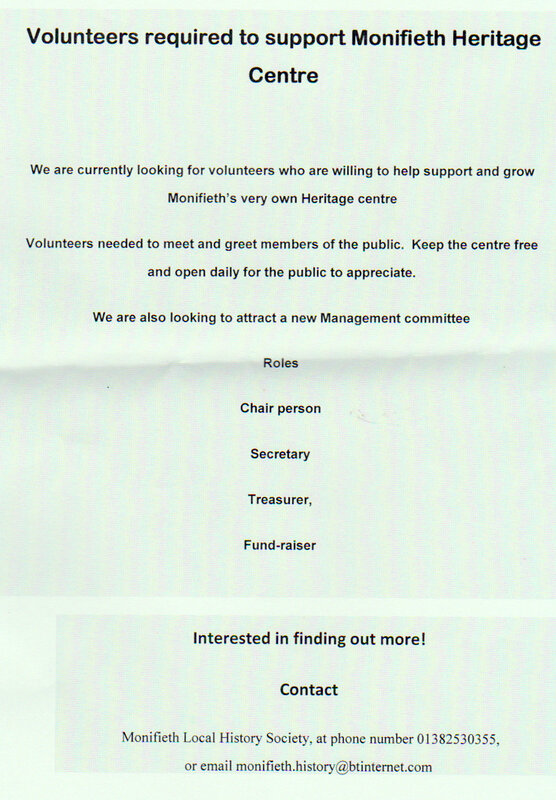 The time has come for the community to play a greater role in the displaying of their items etc, which indicates their desire to retain the Monifieth Heritage story in the place where it belongs Monifieth. 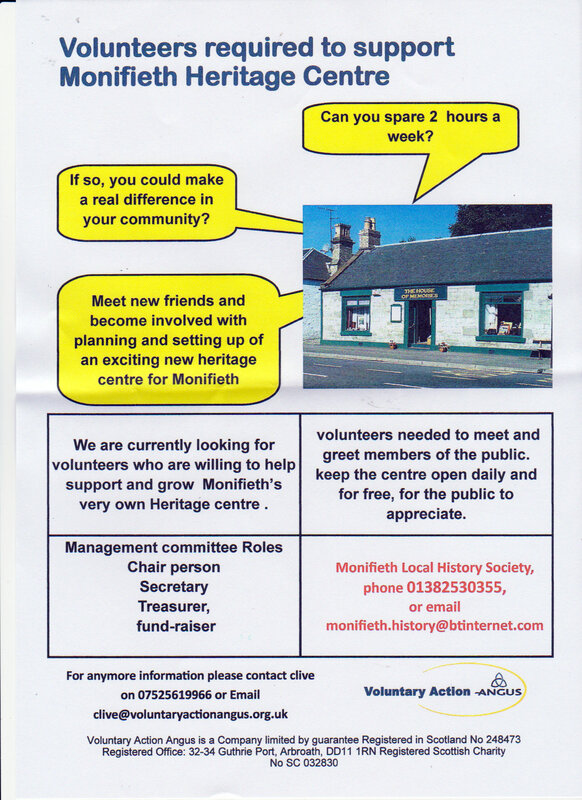 Monifieth Local History Society would continue to use a Community Heritage Centre as their ‘work base’, and provide most the services established at the House of Memories, with additional benefits for all ages. Talks, exhibitions and participating in fund raising and Community events, being still part of their Agenda, with continued monthly committee meetings and the Annual General Meeting held on the first Friday in November. The Community property of which we are the custodians, some of which was loaned for display, will be returned to the rightful owners. Items gifted to MLHS for display and their property will be given consideration as to their disposal by the Society members. The ‘dream ‘ Heritage Centre for the future lies with the people of Monifieth , who have pledged their support and will be required to honour the action, by becoming committee members or volunteers. We can only make it happen by working together with them.